Kate Jurva is a communicator, speechwriter and speaker coach specialised in making science and research not only understandable, but also relatable for diverse audiences. 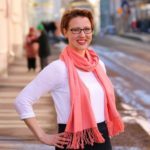 A Finnish-Canadian, Kate has worked for the Government of Canada and the United Nations University, she has created the lineup and speaker training program for a TEDx event, and is currently based at Aalto University where she is building the international strategy for science and research communications. A contradiction between what experts want to say and what the audience wants to hear. A wider audience wants to hear something relatable. Talks and panels, especially talking to their peers. Media interviews from time to time. Social media, personal accounts. Getting involved in societal conversations or talking about their research. On institutional accounts, there will be more videos. Check your education and experience at the door. Drop jargon. Ask the event organizer who is the audience, and work from there. Step into the world and the audience’s world too. Let yourself be excited about the topic, the event, the occasion, or the audience. Aalto University’s new sustainable method to develop fabrics used in Jenni Haukio’s gown, an innovation for the fashion industry. Justin Troudeau describing what quantum computing is.